Three of America’s top super middleweight prospects dazzled Friday evening on a spectacular ShoBox: The New Generation card from the Windy City. Marcus Johnson kept his undefeated record intact with a workman-like performance over Derek Edwards, handing him the first loss of his career. In the co-feature hometown hero Don George stole the show with an explosive unanimous decision over Oumanu Adama and the night opened with an impressive knockout by Edwin Rodriguez over Kevin Engel. Johnson (19-0, 14 KOs) of Houston, Texas, controlled the fight from round one remaining active and cutting off Edwards’ angles. 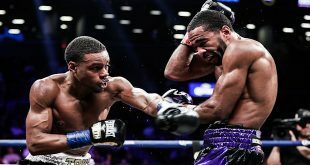 Johnson pressed the pace and by the eighth round Edwards (25-1, 13 KOs) of Winston-Salem, N.C., was clearly running out of steam. 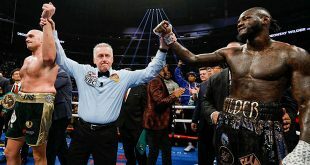 Both fighters rallied for an exciting finish but Johnson was granted the unanimous decision with two of the judges scoring the fight 98-92 and a third seeing it 97-93. George (20-0-1, 17 KOs) and Adama (17-2, 13 KOs) of Acra, Ghana, delivered the night’s most captivating performance. In front of his hometown crowd, George endured Adama’s rapid fire combinations through the fight’s early rounds before knocking down Adama in the seventh round on his way to a unanimous decision. After eight thrilling rounds the judges scored the bout 79-72, 76-75 and 77-74. In the telecast’s opening bout, Rodriguez (14-0, 10 KOs) of Worcester, Mass., landed shots at will to the body and head of Engel (17-3, 14 KOs) of St. Louis, Mo., for five straight rounds. 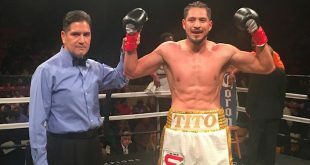 In the sixth round Rodriguez landed a paralyzing right to the body that sent Engel to the canvas unable to beat the count. Referee John O’Brien declared Rodriguez the winner by KO at 2:35 of the sixth round. The evening of fights, which aired on Showtime, took place at UIC Pavilion and was co-promoted by DiBella Entertainment and Eight Count Productions.